Just noticed Barrie's rules are now on line.And the crate thunders have to weigh 3150 and built thunders have to weigh 3250 do you think this is going to even them out? every one knows how I feel about this. I think that built motors have got it good. so much for trying to keep cost down for new guys wanting to get in the class. now all I have to do is decide is it time to build or sit and wait. Do you have some spare cash you can throw my way. I know that I have to build its just thats more money that I have to pay out. I wish that I knew a bit more about the crate before we went out a bought one, I would have gone the other way. My motor was bought by one of my sponsors so I had the money at the time. Oh well thats racing, if you want to go and compete then you need to have all your eggs in one basket. (and yes I know that not just motor wins races its the hole package). I wish they would have went the other way personally. If your going to run different weights leave it 3150 for built and even 3000 for crates. I agree now the whole field (pretty much) has to add 100 pounds to their cars. i think they were complete morons when they introduced this crap crate engine. they should have either phased them in over one or two years and made it a crate class or just left the whole works alone, and they still continue to screw around with an inferior engine and try to fix their mistake with stupid weight rules and such! i say either choose to make it a crate engine class or scrap the whole motor thing. if people wanna use a crate then so be it but they should have to weigh the same as the rest of the cars. this motor needs to go one way or the other. It didn't look like my dad was going to be able to compete for wins next year so he is going to build his crate motor into a built motor. We'll see how that works. 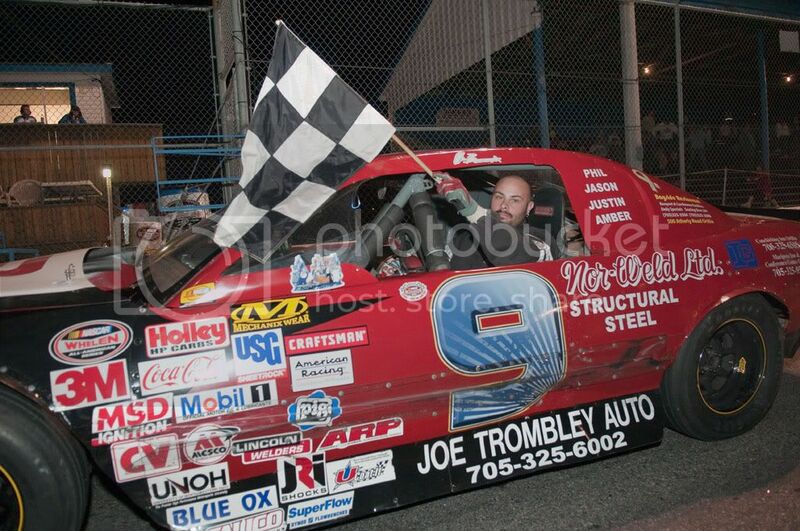 he wants to do well because it's his final farewell season after 30 years since his rookie year at Barrie Speedway. Its kind of screwing things up. Make them lighter not the builts heavier. I think they should have gave thunders the 602 crate and the LLM the 604. Flammmy and Delaware are doing it. I bet with the 602 everyone would have one. I believe that 3250 was a type-o. At the meeting they did say 3150 and I believe they just typed up last years New Gen with a horsepower weight rule.We have full intentions of freshining our crate and staying with it, We feel the 100lbs and the added hp from freshening this old girl will give us enough to make up the little it was lacking. your crate isn't lacking anything! 100 pounds is alot of weight, its going to cost us at least 1/10 per lap. Hope your righ about the typo taj, at the meeting I thought it was equal weight across. Did they not say full tinkits including footboxes as well?. It was no typo. At the meeting that was a hot topic and the track said that they would take everything that was suggested at the meeting in the weeks to following the meet and make a decision on the weight issue. I'm building my motor so I will add the extra and put it where I want. As for the tin kits in the old cars I do remember them saying you could put in a tin kit, all you had to leave was the section of the fire wall where the brake booster is located. When I looked over the rules I didn't see that in the rules so I'm not sure what the decisions on that was.